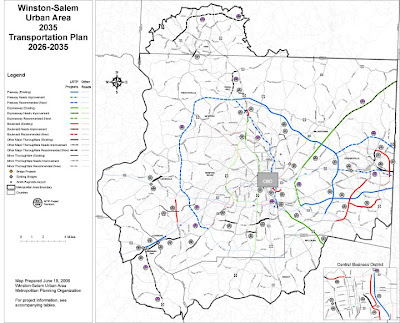 The Winston-Salem Urban Area, which includes almost all of Forsyth County and portions of Davidson, Davie and Stokes Counties, has several long range transportation plans/processes: the Long Range Transportation Plan (LRTP), the Comprehensive Transportation Plan (CTP), and the Metropolitan Transportation Improvement Program (MTIP). The LRTP includes all modes of transportation, and is fiscally constrained as it only includes projects for which funding is anticipated. The LRTP is required under federal provisions and must include an assessment of air quality impacts. The State transportation planning requirement is the Comprehensive Transportation Plan (CTP). The CTP is a long range plan for all modes of transportation and is not fiscally constrained. The Street and Highway component of the CTP serves as the street and highway master plan for the urban area by identifying both existing roads and the general location of future planned roads. The Metropolitan Transportation Improvement Program (MTIP) is the official transportation investment schedule for State and federally-funded surface transportation projects planned within the Metropolitan Area. The MTIP programs project funding for a seven-year period for all modes of transportation.